It is truly remarkable to see the numbers of people who had the opportunity to cross paths with the late Montreal Canadians hockey legend Jean Beliveau. Modest and selfless, this consummate gentleman has been described as one of the country's greatest sports ambassadors both on and off the ice. Beliveau was a hockey idol for many young Montrealers in the '60s and '70s. We would pretend to be him when playing ice or ball hockey as children. 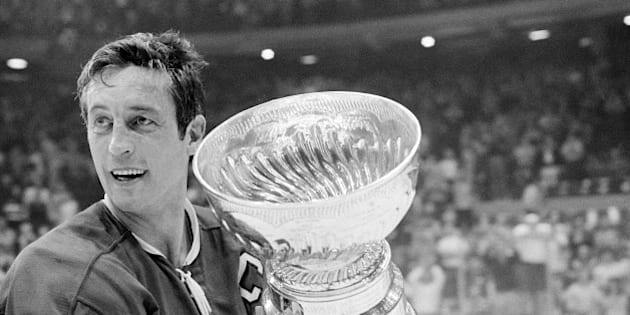 With our eyes glued to the television on many Saturday evenings, Beliveau gave us chills when he scored a goal and many recall the feeling of exhilaration during the iconic moment when the captain of the Habs hoisted the Stanley Cups over Beliveau's head. Back in the day, Beliveau spoiled us with so many opportunities to celebrate team championships. Beliveau's demeanor made us proud to be Montrealers. He spoke fondly of teammates and opponents alike. Since the news of his passing, the man affectionately known as "le Gros Bill" has been showered with unparalleled praise as people have come forward with anecdotes about moving encounters and conversations with him. It is difficult to fathom that someone could so profoundly touch the lives of so many individuals with a simple autograph, letter and/or a phone call. I count myself amongst the fortunate. With the intention of inviting him to speak at a charitable event a few years ago, I looked him up in the phone book on a lark, and there was his number and address listed in the public directory. I phoned and left a message, and much to my surprise, he returned the call within the hour. Sadly, he couldn't make the event as he was going to be out of town, but his repeated apologies were genuine and unforgettable. It was a lesson on how to make someone feel good when saying no -- something which Beliveau clearly did not like to do. I eventually had the opportunity to meet my hero during the shooting of a documentary film about Jackie Robinson breaking major league baseball's color barrier with the Montreal Royals. As a young boy, I imagined Beliveau as a seven-foot tall giant. This inaccurate estimate was attributable to the extra inches he gained on skates (above his 6 foot 3 frame) and the rest was probably tacked on because of the esteem in which I held him. I forgot that the difference in height between us had narrowed over the decades and I was initially astonished that he was not as tall as I imagined. It turns out that he loved the game of baseball, and we had a good chat about Robinson who he admired greatly (though he never got to see him play in the 1940s with the Royals). What a thrill it was to talk about the legendary Jackie Robinson with the legendary Jean Beliveau! Thankfully he chose hockey over baseball and prevented an inestimable number of fans of being deprived of an exemplary role model. Beliveau was my Robinson -- though admittedly on a different scale. He broke down language, cultural and political barriers in Montreal and beyond. He helped us overcome the divisions that we regrettably encountered later in our lives. Whatever our background, we could look to him to capture and inspire our imaginations. Over the decades the Montreal Canadiens have sustained their loyal followers, but for many baby boomers like me, their passion for the team slightly diminished the day Beliveau retired. Today, we're badly in need of more Beliveaus -- both on and off the ice. Au revoir Jean, you'll be very much missed.